Whether you’ve lived in Charleston, SC your whole life or are just visiting for a short while, you don’t want to fork over your hard earned cash every time you want to enjoy the beautiful city. Here are some free attractions that will be sure to please those looking for culture and history. Gallery Chuma – This free gallery offers a bit of local heritage as it specializes in the art developed by and in honor of the Gullah people. The Gullah are the descendants of the Africans who were previously enslaved and settled on the barrier islands between Florida and North Carolina. Sylvan Gallery – For classical European art, be sure to visit Sylvan Gallery. 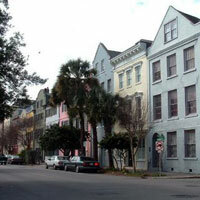 Located in the heart of the antique district of Charleston, it features sculptures and paintings from the modern 20th and 21st century art. The Pour House – The Pour House is a restaurant with delicious Southern foods, but it offers free entertainment. At least once a week, they open up the deck where they host free live music. There is no obligation to purchase any food or drinks as long as you are enjoying the sounds. Charleston City Hall and County Court House – While guided tours do come with a cost, these stately buildings are open to the public to view the stunning architecture both inside and out. The distinctive, historical style is like stepping back in time. Battery Carriage House Inn – This free attraction is not for the faint of heart. After the sun sets, guests are allowed to walk the gardens of what is known as “Charleston’s Most Haunted Inn.” Be sure to keep an eye out for the most common ghosts of Battery Carriage House Inn, the Headless Torso and the Gentleman Ghost. The Old Slave Mart Museum – This free museum tells Charleston’s story of the slave trade. It focuses on the history of the slave trade in the area, but also the role that the actual building played. The Old Slave Mart Museum used to be a building where the slaves were auctioned and sold. It is the only known building that functioned as a slave mart still in existence today. Irvin-House Vineyards – Every Saturday, the vineyard offers free tours of the growing and harvesting process involved with making wine. Come to learn about the art of wine-making in a beautiful grove that you will not be able to find anywhere else for free. If you feel like splurging, adults can spend $2.50 to taste five wines out of a souvenir glass.